8 Cloud Computing benefits that organizations can’t ignore. Cloud computing is a common phrase to hear in the business world. What is it and why is it so important for your enterprise? Cloud is a metaphor for the internet and cloud computing is the method of sharing, processing and storing data on a network of remote servers rather than a local server or a personal computer. Business applications are fast converting to the cloud instead of using the traditional software models as it is much easier to collaborate, share and process data. Cloud helps make Organizations Agile: The most important survival strategy in the new business world will be agility. It is how fast and effectively an organization responds to changes such as demand fluctuation, newer technology, and changing market trends that determines the sustenance of an organization. Cloud solutions help in changing the infrastructure set-up without exorbitant costs and cost of change. Starting from a small investment and testing its viability and then stepping up the migration possible is an unmatched benefit offered by Cloud. Cloud is the latest technology for enterprises: Staying updated with latest technology and using it for modernization of business is fundamental for good growth in your enterprise. With cloud computing, you can ensure modernization of your business with lesser expenditure, streamlined processing and consolidated information sharing with quicker deployment and easy integration in comparison to the traditional apps. Improves Business Processes: Businesses are running all kinds of apps in the cloud such as customer relationship management, HR, accounting, and much more. Some of the world’s largest companies moved their applications to the cloud for better collaboration between inter and intra departments. With improved and streamlined processes of the company, the business value increases leaving both the employers and the employees more satisfied with their accomplishments. Provides greater security than Traditional Apps: For any organization, protection and safety of its data is of utmost importance. With cloud computing a company receives better security options through the vendors who provide services of data backup, data auditing , 24/7 customer support and enhanced security protocols. You can choose the kind of services you require from the vendor as per your business needs. Improves Accessibility: You can access your cloud app from anywhere in the world if you have an internet connection. You need not wait for your office desk to access the info required for your business that means you can run your business from anywhere in the world without entering your office premises. Cloud apps are Simpler-to-Use: Traditional business applications require variety of hardware and software and are complicated and expensive in comparison to the cloud. A team of experts is required to configure, test, install, secure, run and update the traditional software. With cloud computing, the traditional processes become obsolete as the hardware and software do not have to be managed by your company. Instead, it is the responsibility of the vendor who provides the cloud solutions to you. A cloud app just needs a browser, your logon credentials and customization needs, to be up and running within a few days. You do not need to worry about the infrastructure or its security as it is the responsibility of the vendor again. Cloud apps are more secure, automatically updated and cost much less than the normal apps. You have to pay for what you need and not for the entire infrastructure or its maintenance, up gradation or security. Cloud Computing makes Sharing and Communication Easier: With cloud computing, communication sharing has become that much easier for employers and employees. Emailing, video chats or conferencing, virtual teams, webinars are consolidated information sharing center has become possible with cloud computing. Even the process of sharing data externally has become easier through the cloud, for example, social media marketing or remote assistance to customers or online campaigns are instances of external communication. Cloud is Environment-friendly: The cloud is proven to be more efficient than the typical IT infrastructure and it takes fewer resources to compute, thereby saving resources and costs. For example, when servers are not used, the infrastructure normally scales down, freeing up resources and consuming less power. At any moment, only the resources that are truly needed are consumed by the system. Your best moments in life, now one click away..! Most of us take lot of photographs to save the best moments of their life, odds are you take most of your photos using your smartphone. And whether there are photos of your adventure trip or a night out, sending photos to friends and family just got easier and simpler. Now, you can save time and insert your Auto Backup photos from your phone into Gmail messages on the web using the new Insert Photo button. 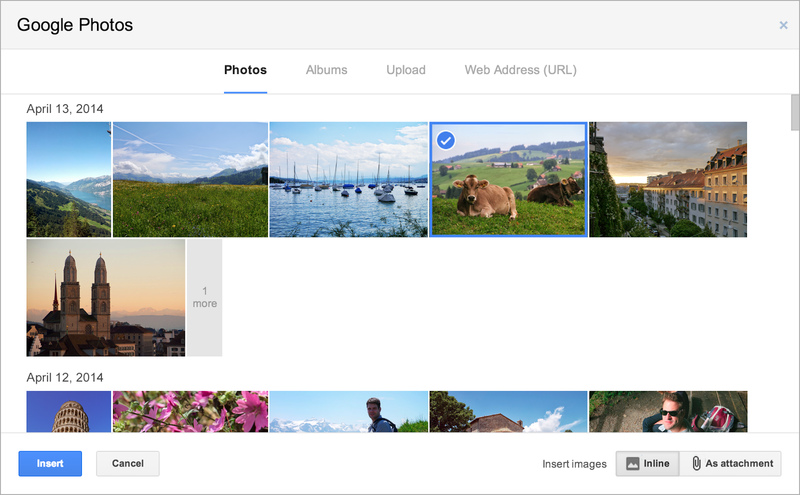 When you click the Insert Photo button, you’ll instantly access all the photos that are backed up from your mobile devices, starting with the most recent. 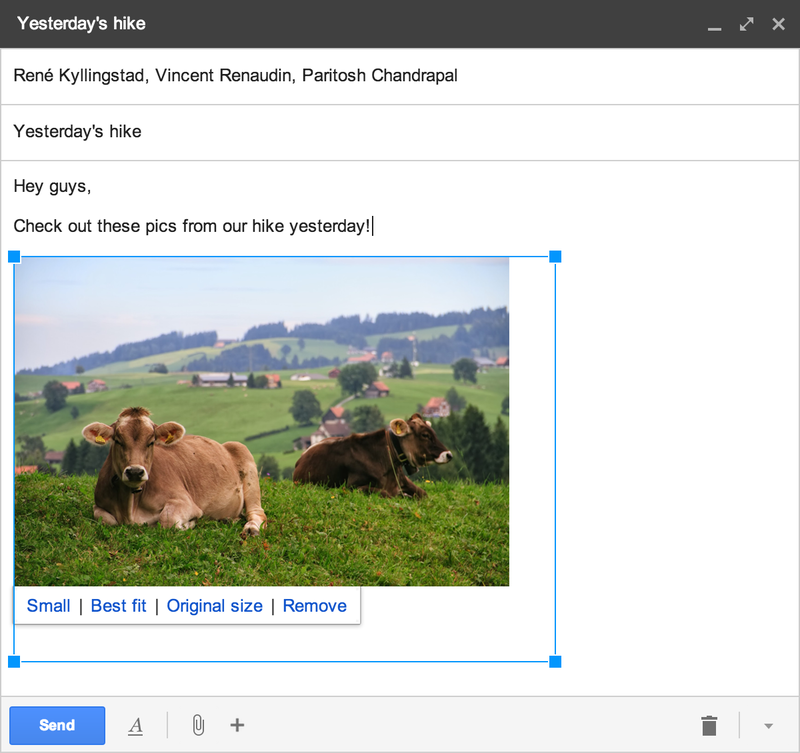 These new features will be rolling out today in Gmail on the web. If you haven’t already, turn on Auto Backup so you can easily include photos from your latest adventures in emails to family and friends. Social Media – A Savior of your Small Business? Social media is a buzz word which is being tossed around in the business circle as the latest marketing technology and rightly so. if you have ignored this medium till now and continued to tread the traditional way, it is time for you to wake up to this platform and include it in your business marketing strategy. Most people won’t disagree that social media can give your business the boost it needs for a better growth and performance. 1. Connects you with users, directly: Through social media, you can directly engage with your existing customers as well as your potential customers. It gives you the platform for direct interaction with the users and enhances your visibility. 2. Personalizes Marketing: Social media can give a personalized touch to your marketing .You can create relationship with users who would have not otherwise used your product or have not been aware of it. You can make people aware of your product in a more conversational way. 3. Facilitates Direct feedback mechanism: It opens up the process of direct feedback. Existing customers or users can voice their views and opinions about your product. It is a good way to gauge your product’s performance and popularity as social media users can directly respond to your interactions. 4. Enables forming communities and groups: Your business enthusiasts and loyal customers can have the chance to form communities and groups to talk about your products and share their views on it. These groups, communities can keep the users updated with your latest recent developments, offers, and products. 5. Great Opportunities: Offers opportunities and exposure to your company and also spreads the word about your presence in the business world. The above list is not exhaustive but is surely indicative of various advantages of employing social media in your marketing plans. Staying with the current trends in terms of development and technology is an important rule for success in business. Today’s technologies offer you to interact with your customers in many ways. More and more companies of all sizes are grasping the social media platform for this very reason. Google+, Facebook, Twitter, LinkedIn or YouTube and other free social media platforms can provide you with the best marketing and advertising strategies. If used innovatively, they can make you popular with the users and give a speedy visibility to potential consumers. It is a good alternative to traditional way of interacting with consumers through TV, radio or print media. This is the new way to communicate and establish rewarding relationships with the consumer market. Use the social media innovatively : Create interesting posts and interactive platforms. Make sure your content is not only informative but also captivating and appealing. Fathom your consumer’s reaction and channelize your action in the same manner. Provide your consumers with tips and fun facts. Add pictures, share useful reference articles, and include hashtags, for example #SocialMediaHelps. Do not just promote your business, promote your area of expertise as well. In other words, show that you are an expert in what you do through your posts and other interactions. This will give you the edge and earn the respect of your followers who might be you prospects or consumers. Use your social media pages for sharing information and making conversation. Answer the queries of your customers, this will make you not only visible but also available for them and ensure them of good customer services. Creativity plus technology can take you far in business. Social media can be adapted to the needs of your business and you can mould it to your advantage. It is definitely the modern marketing technique and has proved to be very fruitful as well, if channelized wisely. It is normal to make errors during the course of the business and if the errors can be rectified easily, things may not go beyond one’s control. However, sometimes we tend to misjudge the magnitude of the repercussions that can be caused by a “minor” error. One of the common errors of the business world is payroll errors or compensation mistakes. Though easily rectifiable, sometimes they can cause more damage than you think! Making errors while computing the compensation can be serious and costly. This can hamper the reputation of your organization as well. Frequent over-compensations can result in extra payments and under-compensations can result in disgruntled employees and may even lead to fines to be paid for lack of compliance under the labor laws. In the event of over-compensation, recovery of excess salary from the employee can be an uncomfortable process involving extra procedures and painful paper work. On the other hand, if the payroll reflects lesser salary compensation than the correct amount due, it can dampen the employee’s expectations and result in more dissatisfied employees. In both cases, the company’s image and reputation is affected and the capability of HR employees is questioned. Contact the concerned people – First and foremost contact the concerned people and inform them of the error. Inform them of the steps you will take next to rectify the error. Make sure you contact them in writing as well. Admit and Acknowledge – It is best to accept your mistake. Admit that an error has been made but assure the affected people and the concerned officials that it will be amended without delay. The worst thing to do in such as a case if to cover up the mistakes or ignore them unless those affected come back and complain about it. Act fast to fix the error – Without much ado, fix the error fast. The longer the delay, the unhappier your employee is and higher are the chances of fines. Delay in taking actions may aggravate the situation and worsen the organization’s reputation. Hence, fixing the error without much delay is important and you should let the affected people know that you are doing your best for early rectification. Once the compensation is rectified, be sure to inform the concerned people of the same in writing and you can attach the amended compensation receipt as well. Handling payroll and compensation manually can be a daunting task with many compensation heads and salary components and the numerous categories of employees. To ensure systematic and efficient payroll management, it is best to use a payroll management software. The automated technology minimizes and removes manual intervention and ensures that compensation calculation is accurate and that payments are processed correctly along with the required taxations. Hours of working over spreadsheets and excel sheets will be avoided and the payroll software shall help in preventing errors. A payroll software can easily ensure that correct payment is made on time. Thus, efficiency will increase without the need of ad hoc use of the spreadsheets. Hence chances of future payroll errors and mistakes will be weeded out as well. Using an Online Payroll can further help you stay transparent with your employees and easily share payroll information. It can also help rectify some problems before payroll could be processed, like attendance and effort in hours. It is important for any growing organization to focus its energies on core business areas and adopt technological solutions to give efficient and cost-effective management solutions.